Through National Dance Showcase’s continued efforts to go paperless as well as supporting the dance community, we have implemented an online entry incentive. For every entry registered on-line, NDS will donate $1 to a Nonprofit Dance Organization. We are proud to introduce our trophy donation program. Each studio may elect to not receive trophies, and in return $5 per entry will be donated to a not-for-profit dance organization. Please contact the office upon registration for this election. This is an incredible way for your dancers' gifts and talents to positively affect and directly support our dance communities!!! All entries must be registered online no later than 30 days prior to the date of the competition. We do not accept paper entries. In order to be eligible for a rebate for fall of 2016, a deposit of $500 is required by September 15, 2016, entries must total $2500 or more, and payment in full must be remitted within 21 days prior to the event. In order to be eligible for a rebate for Spring of 2017 events, a $500 deposit is required by December 1, 2016, entries must total $2500 or more, and payment in full must be remitted 21 days prior to the event. This deposit will guarantee a studio’s place at that specific event. Studios that do not reserve their spot with a deposit will be accepted only if space is available after reserved studios are scheduled. Without a deposit, space is not guaranteed. The Nationals’ rebate deposit deadline is April 15, 2017. (Please note: All discounts are automatically calculated on our online system. Please contact our office for entry fees. ABSOLUTELY NO STUDIO CHECKS OR ANY PERSONAL CHECKS WILL BE ACCEPTED AT COMPETITION. All entries and payment from studios must be submitted with one studio check or credit card online. 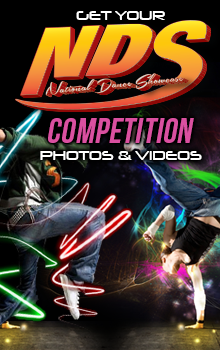 National Dance Showcase, Inc. (NDS) will only accept and process entries for which entry fees have been paid in full. All checks returned by the bank for any reason will incur a service charge of $25. Payment of restitution will be accepted by certified check or money order only. Please note: all participants are automatically assessed a $20 DVD fee to receive a studio DVD of all entries submitted by the studio at that event. Solos: Petites under 5, 5-6, 7-8 // Juniors 9-10 // Pre-teen 11-12 // teen 13-14 // Pre - senior 15-16 // senior 17 -19 // adult 20 and over ; Duo/Trios and Groups: Petite under 5, 5-6, 7-8 // Juniors/Pre-teen 9-10, 11-12 // teen/Pre-senior 13-14, 15-16 // senior/adult 17 -19, 20 and over Overall. Scores will be awarded for each of the newly revised seven separate age divisions. Ages are calculated as of the first day of competition of a regional event and national finals. For routines with more than one dancer, the age is determined by the averaging the age of all participants in that entry. If the average of the ages ends in .5 or more, round up to the next whole number. Example: If the average age is 15.5, round up to 16. (Please note: when registering online, age calculations are automatically calculated)..
PROFESSIONAL/PRO-AM – Only persons defined as “professionals” are allowed to compete with an entry in this division. A professional is defined as a person who receives compensation for teaching and/or performing dance. These dances are inelligible for any cash prizes. 3 minutes for a Solo, Duo/Trio, Small and Large group; 4 minutes for a Line, 8 minutes for a Production. 5 points are deducted for every 15 seconds that a routine is over the time limit. Any entry that is one minute over the time limit will be disqualified from the competition. No time limit penalty will be assessed as long as NDS is notified and the extended time is approved prior to the event. Only one cued song per CD is permitted. All tapes CDs must be turned in when the studio registers at the competition. CDs must be clearly marked with the name of the routine, the studio code and the entry number. A studio representative MUST have a back-up CD readily available in the event of a malfunction of the original. Acrobatic/Gymnastic, Open, and Dance Team may include more than 3 passes. All other categories are restricted to a maximum of 3 acrobatic/gymnastic passes. A pass is defined as a series of connected acrobatic/gymnastic moves or movements. A deduction of 2 points will be taken off the total score for routines that exceed these limits. General lifts are permitted and do not count as a pass. Each entry will be evaluated by a panel of 3 judges. Each judge has a total of 100 points to award. A perfect score is 300 points. Score sheets are given to a studio representative at the end of the competition. Platinum Perfection 295–300; Platinum 290–294.9; Elite Gold 285-289.9; High Gold 280–284.9; Gold 270–279.9; High Silver 260–269.9; Silver 250–259.9; Bronze 249.9 and below. All routines scoring a Gold award or higher at an NDS pre-qualifying event is invited to compete at the NDS Nationals. To attend NDS Nationals, all entries must pre-qualify either at an NDS Regional event, at the pre-qualifying event at the start of Nationals, or by video tape submission. (Please note: Platinum Perfection will be distinguished separately as a special award. During the announcement of adjudicated scores, these awards will be announced as Platinum). Junior & Senior DANCE-OFF – $100 and trophy. Recreational level entries are ineligible for cash prizes. SOLOS – if a performer competes more than 1 solo, only the highest scoring solo will be eligible to be placed in the overalls. STAR CHAMPION SCHOLARSHIP – Star Champion registration fees are waived and they can also compete one solo at Nationals free of charge. Scholarship certificates MUST be submitted upon registration. The solo entry must be registered separately by the dance studio director or teacher on our online system. Only one entry will be awarded and entry fees waived, even if a dancer is awarded several scholarships. If a scholarship winner does not participate as a Star Champion, the scholarship is forfeited and all National fees will have to be paid for the dancer to compete the solo (or duo/trio). A minimum of ten routines is required in each division/category including title in order to receive a monetary award. Entries in the 30 and Over age division are ineligible for cash prizes and Top overall awards. No changes will be permitted within 7 days prior to the date of the competition. Any changes made within 7 days of competition will incite an additional $5 per change fee. All cities, dates, and locations are subject to change. Please check website for updates. NDS bears no responsibility for and no refunds will be issued for interuptions or cancellations that are beyond our control, including, but not limited to: weather related issues, technical malfunctions, facility conditions. Soloists may not compete against themselves in the same category. No dangerous props are allowed, to include but are not limited to fire, glass, swords, or knives. All entries must be suitable for family viewing. For the safety of the performers no cameras of any kind will be permitted in the theater during the competition. This includes but is not limited to photographs or video taken by cell phones or any electronic equipment of any kind. NDS reserves the right to confiscate cameras if warranted and will return them at the end of the event. IF A PERSON VIOLATES THIS RULE THEY WILL BE IMMEDIATELY ASKED TO LEAVE. We ask studio directors and teachers to advise parents, dancers, friends and family of this rule and to help enforce this rule for the safety of all dancers. If a person related to a studio continuously ignores this rule, a penalty will be assessed upon the associated studio. A studio representative must be present at all awards ceremonies. Trophies , DVD critiques, scoresheets, music and Judges’ critiques will NOT be mailed after the event. RECREATIONAL – For those dancers new to the world of competition, and who train no more than 3 hours per week. These entries will compete against other recreational entries for adjudicated scoring. Recreational division will not be eligible for cash prizes. COMPETITIVE – For those dancers with at least two or more years of competitive experience, and/or who train more than 3 hours per week. ACROBATIC/GYMNASTIC – 50% dance 50% acrobatics. BALLET – Dancers execute ballet technique. CHARACTER BALLET – Dancers incorporate ballet technique while portraying a character. POINTE – Dancers wear pointe shoes and execute pointe technique. TAP – Dancers execute tap technique. CHARACTER TAP – Dancers incorporate tap techniques while portraying a character. CLOGGING – Dancers wear clogging shoes and execute clogging technique. DANCE TEAM – Dancers perform a high-energy routine having sharp and precise movements. Pom-poms may be used. HIP HOP – Dancers perform a dance which includes the latest street dance style as seen on MTV. JAZZ – Dancers use jazz technique. CHARACTER JAZZ – Dancers incorporate jazz technique while portraying a character. MUSICAL THEATRE – Dancers interpret a song from a “Broadway” or movie musical. LYRICAL – Dancers interpret the lyrics or mood of a song using a combination of ballet and/or jazz. MODERN/ABSTRACT – Dancers perform an abstract style of movement. CONTEMPORARY – Dance that employs systems and methods found in modern dance and postmodern dance. ETHNIC/FOLKLORIC – A dance style of a particular ethnic group. SONG and DANCE – Dancers sing as well as dance. Routines must contain at least 50% singing and 50% dancing. (Lip-syncing does not qualify as singing). TWIRLING – Dancers use a baton and/or twirling props. STUDENT CHOREOGRAPHY – Dancers perform an entire dance which must be choreographed by a student without the assistance of a teacher. FASION MODELING – Formal (solos only). FASHION MODELING – Sportswear (solos only). FASHION MODELING – Swimwear (solos only). VOCAL – Routine may be any type of vocal presentation. Accompaniment must be on tape or CD. No lead vocals permitted on tape; backup voices only will be permitted. Outstanding Costume Award – Entry fee is $25. This award will be presented to the most outstanding costume of the competition in both the Junior and Senior age divisions. The decision will be based upon design, overall impression and fit. Solo Photogenic Award – Entry fee is $35for the first photograph and $10 for each additional photograph. This award will be presented to the solo contestant judged most photogenic in the Junior and Senior age divisions. Entries must send a recent 5” x 7” or 8” x 10” will be returned on the day of the competition. Contestants will be responsible for retrieving their photo on that day. NDS is not responsible for any loss or damages to any photograph submitted. Best of NDS Award – This award is presented to the highest scoring routine of the entire regional event. This routine’s fees will be waived for NDS Nationals. NDS Impact Award – One Petite/Junior and one Teen/Senior entry will be selected by the judges to receive the NDS Impact Award. This entry must be a Group, Line or Production. Each NDS Impact Award winner will receive free competition entry fees for that routine at the NDS National Finals in Atlantic City, NJ. NDS Choreography Awards – This award will be presented to the teacher of a Small Group, Large Group, or Line for both the Petite/Junior and Teen/Senior age divisions. NDS Backstage Bravo Award – Awarded to the team that demonstrates the best sportsmanship and most cooperation backstage and in the audience. NDS DANCE-OFF – At each regional competition, NDS judges will select small group, large group, and line competitors with the opportunity to participate in the NDS Dance- Off Showcase. These will be held at the conclusion of the Petite/Junior and Teen/Senior sessions. The invitation will be determined by the judges, based on the entertainment value and merit of an encore performance. This performance will then be judged to receive the NDS DANCE-OFF AWARD and a $100 cash prize. All Groups participating in the Dance Off will receive a $100 credit towards our National Finals, for which they qualified. THIS AWARD IS NONTRANSFERABLE AND CANNOT BE APPLIED TO ANY OTHER ROUTINE. No Productions or Recreational dances are eligible for the Dance-Off. REGIONAL TOP OVERALL AWARD WINNERS – These awards will be presented in each of the Petite, Junior, Teen and Senior age divisions at the competitive level. Solo Champion – $50 and trophy; Duo-Trio Champion – $50 and trophy; Small Group Champion – $100 and trophy; Large Group Champion – $100 and trophy; Production/ Line Champion - $150 and trophy.